Britannia Shopping Centre (Hinckley, Leicestershire) is run by property management company M J Mapp, who manage nearly £4 billion worth of commercial concerns throughout the UK & Europe. M J Mapp are unusual in their commitment to maximise the value of the properties they manage. An example of their commitment they show to their clients is their desire to develop a top-notch, innovative website that highlights & advertises the tenants, both large & small, in the shopping centre. We were asked to develop one—and we were given a fairly free hand to do so. For a website that is trying to encourage you to visit a physical location, there are three things you need: you need to convey a sense of excitement about the place, you want to let people know what’s there & you need images of the location that appeal to the potential visitor. For the first issue, we made sure the home page had significant visual impact: a big “splash” that fades in a series of photos showcasing various aspects of the shopping centre. 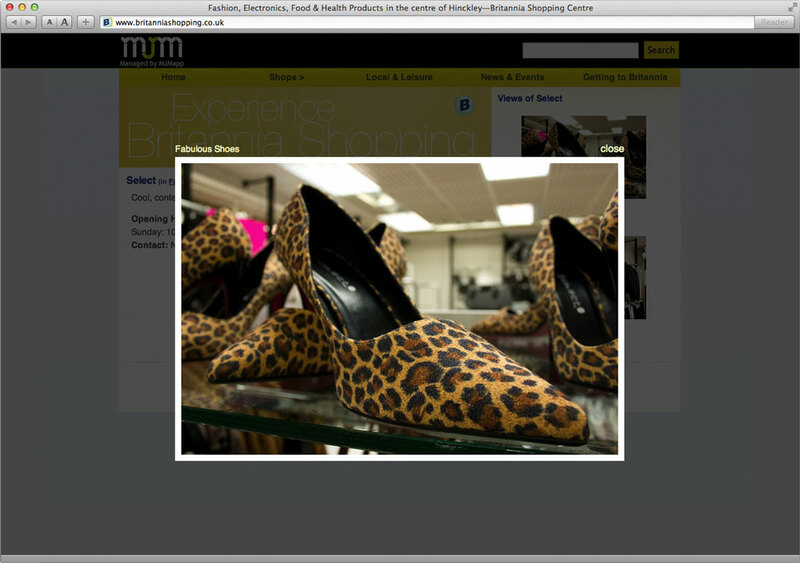 Subsequent pages change the image at the top of the screen when you pass your mouse over items in the navigation bar. For the second consideration, ardes made every shop accessible from any page via the site’s navigation. Moreover, each shop is divided into overarching categories which explain what can be found in those shops: “Electronics”, “Fashion”, “Food” and so on. But this was hardly enough. 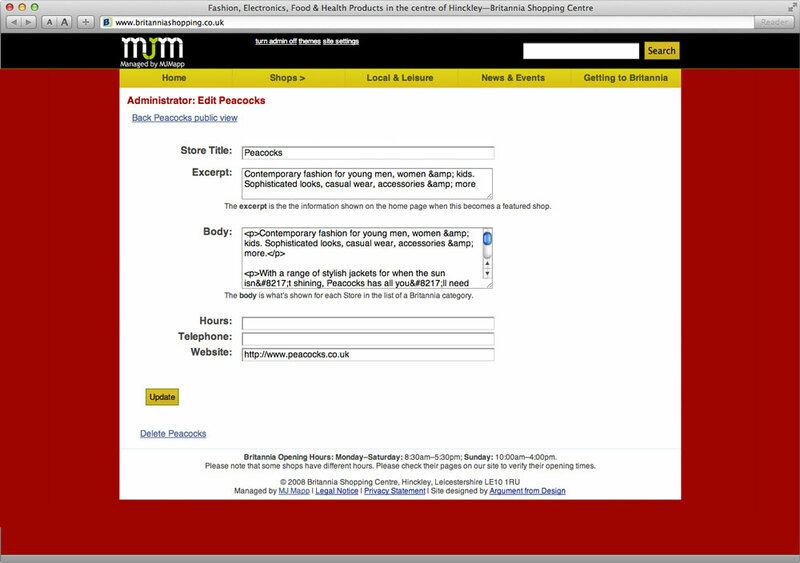 In order to maximise tenant exposure, each shop at Britannia gets its own page which contains information about what the shop sells, its opening hours, a contact telephone number and, if the shop has one, a link to their own website. The content of the page is intimately & automatically linked up with the meta information for each page, making the shops ideally situated for search engine optimisation (or “SEO” for short). 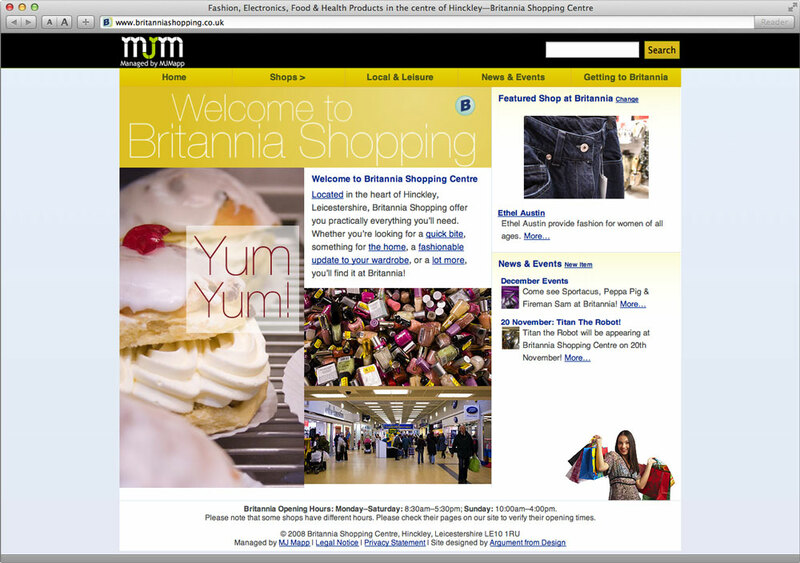 In addition, in order to promote the shops as part of the larger community at Britannia, the website features a specific shop on its home page in order to maximise its exposure. Also, Britannia has a section where they can notify the surrounding community of upcoming events taking place at the shopping centre. Finally, the site’s search function not only collects information about the site from the pages’ content, it also tracks all the meta information on each page—helping site visitors find what they’re looking for as easily as possible by providing more avenues for the information to be conveyed to them—and to search engines like Google. Finally, the shopping centre as a whole & each shop get what really sells a location: photography. Imagery is the closest thing to something tangible when we’re deciding whether to go to someplace new. Accordingly, we spent some time at Britannia, talking to the tenants & taking photos of the shops. The result was to concentrate on the services & products offered at Britannia: tasty food to great, affordable fashion. In addition, we’ve worked closely with the marketing departments of several of the chains that are located in Britannia & can alter the text & imagery for the season as they roll out new products. Critical to the site’s success was our use of Ruby on Rails, a powerful development framework that, when used right, helps us build solid sites confidently. Because we follow Agile Programming techniques & Test-Driven Design, we know that the site’s foundation is rock-solid. This is helpful when adding new features: we know that adding a new feature to such a complex site won’t break pre-existing functionality. Moreover, agile techniques assist in the rapid development of new features. Because we can respond rapidly to requests for new features, this site won’t suffer from neglect as its past iteration did. These techniques are what you find in radical, bleeding-edge development; but we employ them because of the flexibility they give us, not because it’s cool. This flexibility isn’t available in other development paradigms, and it helps make our clients very happy. The result for M J Mapp, and for the Britannia Shopping Centre in particular, is every goal not just met but surpassed. The combination of a rock-solid foundation upon which to build new features, compelling photography & rational information design makes for a significantly streamlined site that truly maximises exposure for their tenants. But it doesn’t end there. The clients can easily administer the site themselves, adding shops, information, news & photography, knowing that the site will accommodate the new content predictably. Because Britannia can advertise their tenants so quickly & easily, they can concentrate their efforts on making Britannia the best shopping centre in the area. See more examples of our web design & photography.